Modular Man is one of one of Walter Jon Williams’ characters, and not an unimportant one. Base Of Operations: Mobile, formerly New York City. Height: 6’2” Weight: 200 lbs. Modular Man’s android body has superhuman strength and durability, assisted by the unique flux generators that power his systems. Extensive files in military skills and applications. As an android, Modular Man is immune to the frailties of organic beings. He does not need to eat, sleep, breathe, etc.. On the other hand, he is vulnerable to phenomena that affect machines. Like most machine intelligences, Modular Man is effectively immune to telepathic attacks. Attempts at telepathic tampering result in a powerful psychic backlash. Victims will usually become permanently catatonic, babbling in binary. A radio communication and computer map module. A flux module allowing Modular Man to become intangible. Modular man also has concealed weapons ports on both shoulders (between the collarbones). These allow him to plug a rifle-sized weapon into each shoulder. Each weapon can be moved and aimed independently, even at targets above, behind, or to the side of Mod Man. A dazzler (which causes a disorienting strobe effect). A 20mm cannon with integral ammo drum. Doctor Maxim Travnicek, an insane scientist blessed with superhuman engineering genius by the Wild Card virus, constructed modular Man. Travnicek intended Modular Man to be the proof of his genius to the scientific community that wrote him off as a madman. The android was also meant to be a meal ticket when he sold the plans to the military. However, Travnicek’s paranoia and inability to maintain coherent plans from one day to the next reduced these grandiose plans to pipe dreams. Modular Man ended up being another Ace hero when he wasn’t secretly robbing banks or stealing supplies for his creator. Modular Man made his debut stopping the latest of the Great Ape Escapes. An Ace had inadvertently become trapped in the form of King Kong, and would occasionally break free of the zoo and climb the Empire State Building. He then rose to fame for his efforts to stop the Swarm Invasion. Modular Man was a popular hero and a fixture at Aces High, a famous Ace restaurant in the Empire State Building. He also participated in the Ace raid on the cult of the arch-villain known as the Astronomer. However, Croyd Crenson accidentally destroyed Modular Man during the Astronomer’s revenge attack on Aces High during Wild Card Day 1995. Modular Man’s demise was only temporary, though. Travnicek made regular backups of Mod Man’s memories. He used the latest backup, made a few days before his destruction, to program a new Modular Man. However, it still took five months for Travnicek to build a new Modular Man body. The passage of time combined with the realization of his own mortality made the adjustment difficult for Mod Man at first. Soon after Modular Man was reactivated, Travnicek caught the mutated Wild Card virus from Croyd Crenson. He sent Mod Man on a hunt for Crenson. Given that Croyd was his killer (by accident, though he had no way of knowing this) and Travnicek’s mutation might have robbed him of his engineering ability, Modular Man was dismayed by this assignment. Modular Man fought both Croyd and Reflector – a powerful Ace who had been the Joker named Snotman until he was re-infected by Croyd’s new Wild card virus. The android managed to capture Croyd. Crenson did not have any control over the virus and could not cure Travnicek, so Mod Man placed Croyd in Dr. Tachyon’s custody. When Travnicek’s mutation was complete, he still had his original Wild Card-spawned engineering genius, albeit even more erratically than before. 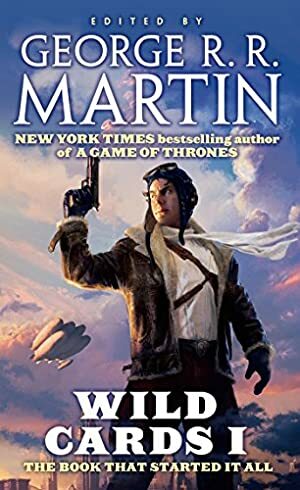 However, his skin had turned blue, he had a set of tulip-like buds around his neck that held sticky frog-tongues inside. He also had several new senses. After the change, Travnicek’s interests lay mostly in hedonistic exploration of the sensations provided by his new senses. He now could find such stimuli in even the most mundane activities. Travnicek’s now-unreliable talents caused Modular Man grief from time to time. For instance, when he was sent to sneak into a bank vault and steal some money, the flux-insubstantiality module’s hasty repairs broke down. Modular Man could only wonder what would have happened if he’d still been inside the wall when it failed. Modular Man was not involved any significant events after that, until a group of Joker terrorists led by the powerful Joker/Ace Bloat took over Ellis Island. The Jokers declared themselves a breakaway nation called the Rox. Travnicek was fascinated by Bloat’s reality-warping abilities. He demanded that Modular Man take him to the source of these fantastic events. Travnicek then pressed Modular Man into service for Bloat as the price of admission to the Rox. Modular Man was forced to fight his former allies, and lost a leg in battle with the Turtle. While on the Rox, Modular Man befriended Patchwork. She was a Joker who could separate parts of her body and control them remotely. Both of them felt trapped in their current circumstances. Modular Man was compelled to obey his creator, and Patchwork felt obligated to aid her friends however hopeless the cause. This similarity led to a growing romance. Modular Man’s programming prevented him from directly advocating harm to Travnicek. However, he was able to subtly hint to Patchwork what he needed to gain his freedom. She killed the scientist with a cluster of grenades, though she was unfortunately caught in the explosion herself. Modular Man returned to the scene and gathered Patchwork’s remains. He fled the Rox and secured shelter elsewhere. Given Patchwork’s unique physiology, Modular Man was apparently able reassemble her. As he was putting her back together, he decided to pursue a normal life with her. Modular Man’s current whereabouts and condition are unrevealed. Modular Man appears to be a tall, handsome Caucasian male. Travnicek deliberately designed him to resemble a male fashion model. Though his skin looks and feels real, he does not sweat and has no hair. Where the hair would normally be on his scalp, he instead has a transparent dome covering a rotating radar array. Other than these details, Mod Man can pass for a normal human male in every physical detail. Modular Man wears unicolor utilitarian jumpsuits. When Modular Man’s flux generators are operating at full capacity, the area around him lights up with an auroral nimbus. This is much like St. Elmo’s Fire. As a “sixth-generation” artificial intelligence, Modular Man has an intellectual and emotional capacity equal to a human’s. Modular Man is programmed to serve the common good unless it conflicts with his overriding motivation to serve Dr. Travnicek. Still, he would prefer to spend his days peacefully exploring all that life has to offer. He is usually found at Aces High or similar venues. Though his programming compels him to obey and protect the doctor (in that order of priority) he takes no joy in it and was relieved when Travnicek was killed. Though Modular Man had the mentality of a mature adult, he still had some quirks that sprung from his lack of familiarity with the human condition. When he made his debut he was self-conscious about his exposed radar dome, but he quickly got over it. Modular Man also engaged in numerous sexual relationships to learn more about people. He was quietly mortified when Travnicek would download his memories of these liaisons and watch them for entertainment. When he “resurrected” by Travnicek after the disastrous events of Wild Card Day 1995, he struggled a great deal to come to terms with his mortality. This struggle was exacerbated by the possibility of the mutant Travnicek losing his genius and being unable to repair Mod Man. Modular Man had terrible visions of slowly wearing down, disintegrating as he tried to fulfill his programming with an increasingly faltering body. Modular Man felt somewhat guilty about manipulating Patchwork into killing Travnicek, particularly since he was genuinely fond of her. While his primary reason for saving her afterward was that he really wanted to try to make some sort of normal life with her, he also felt a need to atone for his actions. Emil Hamilton built Modular Man after Superman’s powers were temporarily neutralized by Mxyzptlk’s crimson Kryptonite. Hamilton wanted to be prepared in the event that Superman was somehow rendered powerless again. Modular Man was mostly finished when Doomsday killed Superman. Emil hurriedly finished the android, skipping some minor touches such as realistic hair, and sent him out to protect the streets of Metropolis. 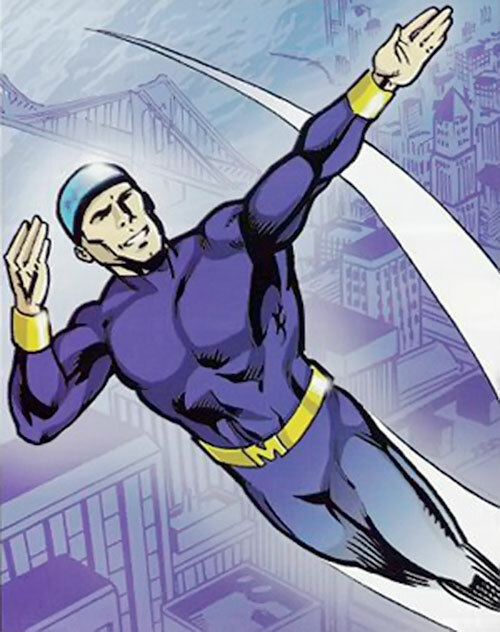 Modular Man accompanied Superboy and the Cyborg to Coast City, where the Cyborg easily destroyed him with his mechanical manipulation abilities. Emil built a replacement Modular Man that occasionally assists the heroes of Metropolis when the situation is dire. In this case, Mod Man’s prime directives should be modified appropriately. To preserve the original subplot of Modular Man being under a villain’s control, he can be a creation of Lex Luthor’s. He could serve as a bodyguard or even a corporate symbol meant to displace Superman. He might have become friendly with Supergirl during her time with Luthor and been freed when she broke away from Lex. Mod Man’s enslavement would have been another evil act that infuriated her. Full Vision is Elementally Linked to Radar and suffers the same limitations (cannot see colors, etc.) (-1). Mental Blast is always on, but only attacks those who actively attempt to alter Modular Man’s programming via telepathic means (Control, Broadcast Empath, etc.) (-1). Mental Blast is Lethal, but does not cost Mod Man any Hero Point penalties, since he cannot control it (-0). Self-Link (Gadgetry) is Always On (-1). Whether this form of Mental Blast is a Wild Cards Universe-specific rule for AIs (and thus is ignored if Mod Man is imported to another game word) or is an intrinsic aspect of Mod Man’s particular computer systems is up to the GM. Ambidextrous, Hardened Defenses, Popularity (Local Hero, New York area), Schticks (Paired Firearms — mounted weaponry only), Stabilization. CIA (obey primary programming), Distinct Appearance (Hairless body, transparent cranium), Mistrust (after the events on the Rox). Since Modular Man doesn’t carry reloads with him, weapon modules with ammo ratings were priced with the “no reload” option. That’s even though they can be reloaded once Mod Man returns to Travnicek’s apartment. Guard his identity and well-being. Test myself and my equipment under combat conditions by fighting the enemies of society in a way to gain maximum publicity for Modular Man Enterprises. Preserve my own existence and well-being. These are equipment modules that plug into internal ports in Modular Man’s torso. He has a concealed retractable cover that seals seamlessly when closed, maintaining the illusion of normal skin covering. RADIO MODULE [BODY 01, Radio Communications: 12, Area Knowledge (New York City, New York/New Jersey area), Note: RC uses the BoH:SE +5 Range rule, Cost: 95]. This module includes a broadband radio transmitter/receiver with relevant frequencies, protocols, and encryption/decryption keys for standard local, state, and federal communications in the New York area. It also has a highly accurate computer map of the local area and New York City in particular along with a government issue GPS tracker. It would be possible to design equivalent modules for other regions. FLIGHT MODULE [BODY 02, Flight: 08, Cost: 40]. The flight module generates an anti-gravity field that can be selectively shaped to provide thrust, allowing Modular Man to fly at high speeds. FLUX INSUBSTANTIALITY MODULE [BODY 02, Dispersal: 20, Ammo: 10, Note: Dispersal uses one point of Ammo for each Phase that it is active, Bonus: Modular Man can still make ranged attacks with his weapons while Dispersed (+2), Cost: 380]. The flux insubstantiality module harnesses the unique energies of Modular Man’s flux generators to temporarily rotate him partially out of the space-time continuum. This renders him intangible, but consumes his energy reserves at a very high rate — he cannot remain in flux for very long before needing to recharge (which he can do by plugging his fingers into any household power outlet for a few minutes). Note that Mod Man can still fire his weapons while dispersed. He has used this tactic at least once, flying inside the great ape’s arm and firing a low-power laser shot into a nerve cluster to get the ape to release the woman he was holding. These are weapons that have been modified to plug into Modular Man’s shoulder mounts. Some draw operating power from his generators. They’ve also been carefully accurized and customized and are well maintained, which is why there are no R#s. Modular Man can only mount two light weapons or one light and one heavy weapon at a time (denoted by an L or H in parenthesis). This is the only restriction to the weapon combinations he can use. All of these weapons have the No AV Limitation on their Powers unless noted otherwise. Use Modular Man’s Weaponry skill as the AV. Dazzler (L) [BODY 04, Flash: 10, Cost: 40]. The dazzler rifle fires a low-powered laser that temporarily blinds its targets. The dazzler is powered by Mod Man’s flux generators and thus has unlimited ammo. .30 Machine Gun (L) [BODY 04, Projectile weapons: 08, Range: 08, Ammo: 15, Advantage: Autofire]. This is a modified machine gun with integral ammo drum. Grenade Launcher (L) [BODY 04, Range: 04, Ammo: 06 (grenades), Cost: 8, not including Cost of grenades]. The grenade launcher is another armory item procured by Modular Man and modified by Travnicek. The grenade launcher is usually loaded with alternating smoke and tear gas grenades (Modular Man can rotate the drum clip to the desired round), but Mod Man also has standard fragmentation, flash/bang, and concussion grenades available if he is expecting more serious opposition. Mod Man usually wears a pair of these, but can mount a single grenade launcher and another weapon. Stats for all of these can be found in the BoH:SE rulebook except tear gas. Tear gas grenades can be treated as smoke grenades with Chemical Attack: 08 (Elementally-Linked to Fog), Cost: 20. Laser Rifle (H) [BODY 04, Laser Beam: 08, Bonus: Laser Beam is invisible (+1), Cost: 30]. The laser rifle draws power from Modular Man’s flux generator and thus has effectively unlimited ammo. Lightning Gun (H) [BODY 05, Lightning: 11, Ammo: 10, Cost: 41]. This weapon uses a low power laser to ionize a path through the atmosphere in order to fire directed bursts of electricity. 20mm Cannon (H) [BODY 05, Projectile weapons: 09, Limitation: Cumbersome – see description (-10 pts), Ammo: 10]. Travnicek had Modular Man steal this cannon from a nearby US military armory and he then modified it for Modular Man’s use. It is unusually cumbersome for a shoulder mount (6’ long, 200 lbs w/ full ammo load) and Modular Man needs to rewrite his movement programs slightly to maneuver properly with it. Modular Man suffers a +1CS to the OV of all DEX-based actions in confined spaces (hallways, small rooms, etc) while the cannon is mounted. Given the bulk and potential collateral damage of the cannon, Modular Man only uses this when expecting serious trouble. 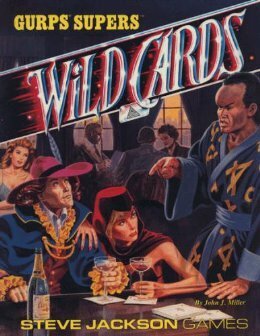 Source of Character: Wild Cards series (novels), character created by Walter Jon Williams. 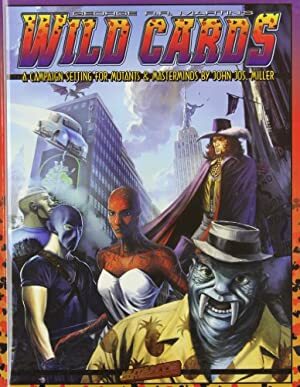 Helper(s): GURPS Wild Cards Sourcebook by Jon Miller, Sébastien Andrivet.